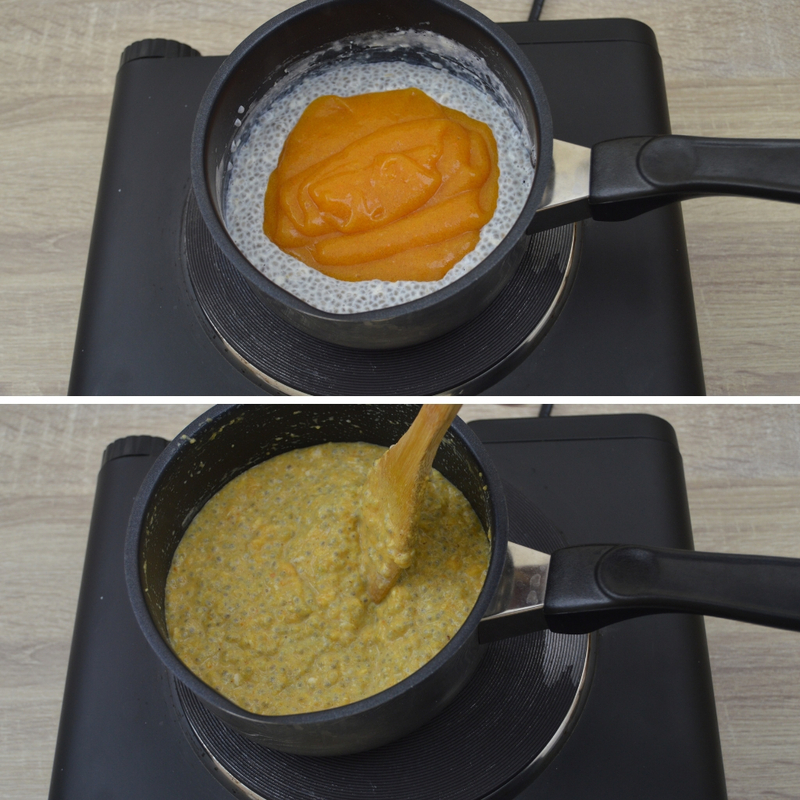 Warm chia porridge with persimmon is rich, thick and healthy porridge ready to eat right away. This quick and instant breakfast will be ready in minutes and doesn’t require overnight soaking. This is absolutely delicious and just perfect breakfast to start your day. Persimmons also known as Sharon fruit are orange coloured fruit with sweet and sugary flavour. Although they appear like a tomato family member these orange-hued beauties are actually berries. This fruit can be eaten raw, cooked or dried. In additions to being incredibly versatile they also contain many important nutrients and antioxidants. Including this fruit in diet is the delicious way to meet our daily requirements of important nutrients. This winter chia porridge is our regular breakfast along with flaxseed porridge, savoury oats porridge, millet dosa and strawberry banana milkshake, pineapple banana smoothie for my daughter. Persimmon is one of our favourite fruits and has never failed to impress guests and family members who tried it very first time. I haven’t yet met a single person who doesn’t like this divine fruit. Chia seeds are unprocessed whole grain seeds that can be absorbed by body as seeds. They are considered as powerhouse of important nutrients such as omega-3 fatty acids, proteins, antioxidants, and fibre. Easy and tasty way to include chia seeds in our diet to get maximum benefits is by cooking with milk as porridge, add them raw to dishes like cereals, yogurt and salads. Soak them in water or milk overnight to make healthy puddings. Traditional chia breakfast recipes calls for soaking chia seeds overnight which requires pre planning. Though I like chia pudding I don’t want anything chilled in this cooler months. Such make ahead recipes are good as grab and go breakfast particularly on summer days. As much as I like overnight chia pudding I must say there’s something interesting about cooking chia seeds on stove top in the cooler months of the year. Cooking chia seeds is as easy as can be, just combine milk, chia seeds, ground cardamom and simmer until it reaches the desired consistency. Once cooked mix in persimmon puree. I just love the coziness of warm bowl of chia porridge in the morning in this cold weather. Since persimmons are already sweet and tasty on their own, I kept this recipe simple with few ingredients without any additional sweetener. The final product was just perfect, light, creamy and refreshing. This warm chia porridge recipe is versatile and easy to customise as per your liking. Is this chia porridge recipe adaptable? Feel free to adapt this recipe to suit your taste preference. You could substitute dairy milk with plant based milk for vegan version. You can play around adding other ingredients. For crunchy toppings you may swap almonds and pumpkin seeds with walnuts, pecans, coconut flakes or melon seeds. Ground cinnamon or ground nutmeg are an awesome add-ons to infuse more flavours into your porridge. Different fruits add different flavours to this porridge. I choose to use persimmon. Any berries, stone fruits such as plums or peaches, citrus fruits such as oranges makes a good combination. You might try pineapple for tropical twist. Actually any fruit would work well. 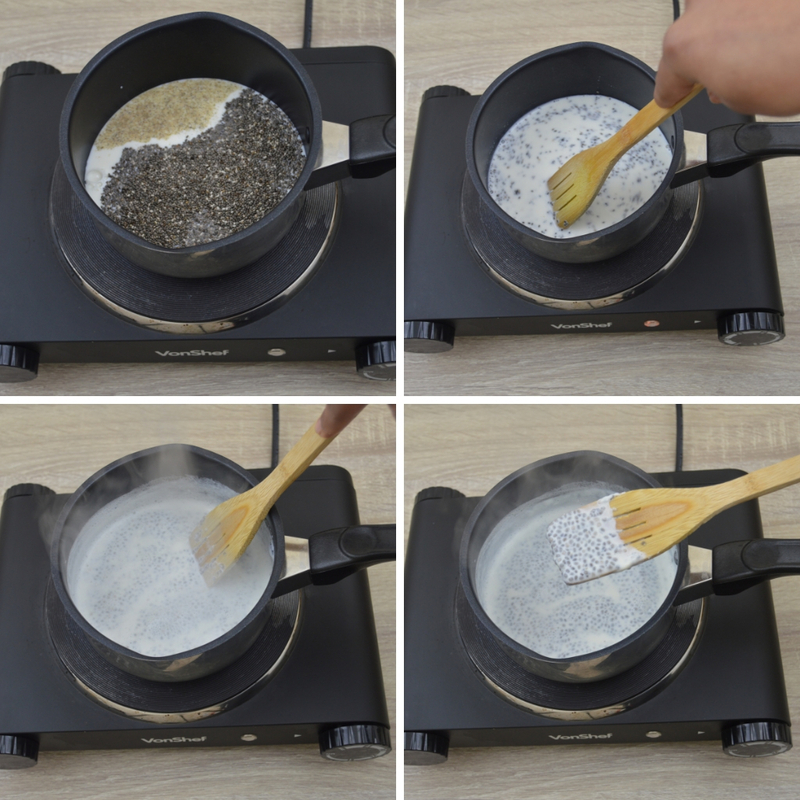 Let’s see how to make warm chia porridge in detail. Dice persimmon into small cubes and blend into a puree. In a saucepan combine milk, chia seeds, ground cardamom stir and bring it to boil over medium high heat. Now reduce the heat to medium low, stir and cook for 8-10 minutes until chia seeds absorb all the liquid and thickens. Turn off the heat. Finally mix in persimmon puree. 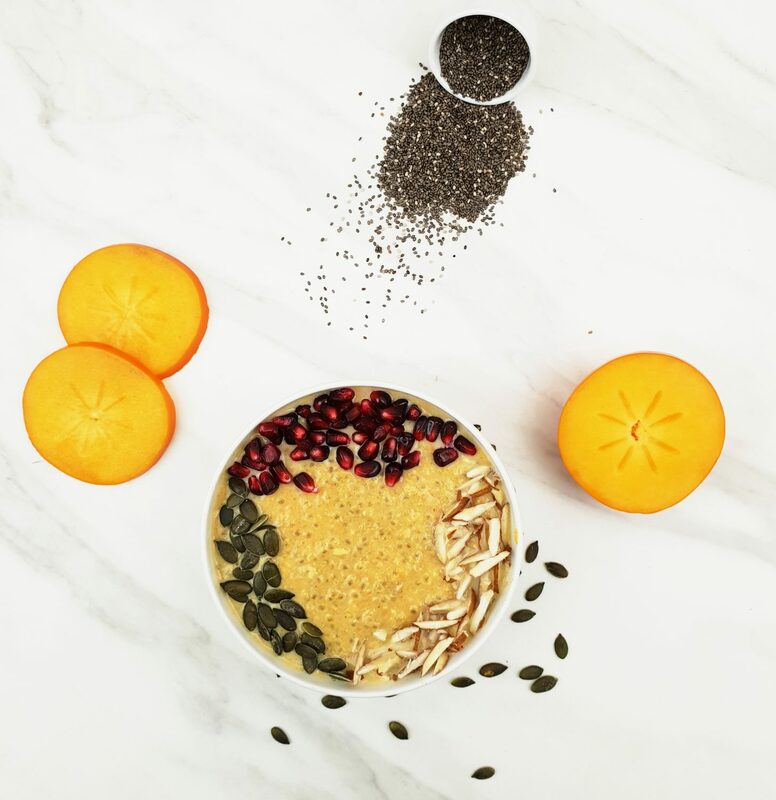 Garnish with pomegranate seeds, almonds, pumpkin seeds and enjoy warm chia persimmon porridge. For vegan version substitute dairy milk with almond milk, coconut milk or any plant based milk. Use as much ripe persimmons as possible to make puree. Persimmons are ripe when they are extremely soft to touch. Fully ripe fruit imparts maximum flavours, sweetness to the dish. Persimmons are natural sweetener in this recipe, you may add honey, coconut sugar or any sweetener if you prefer more sweetness. 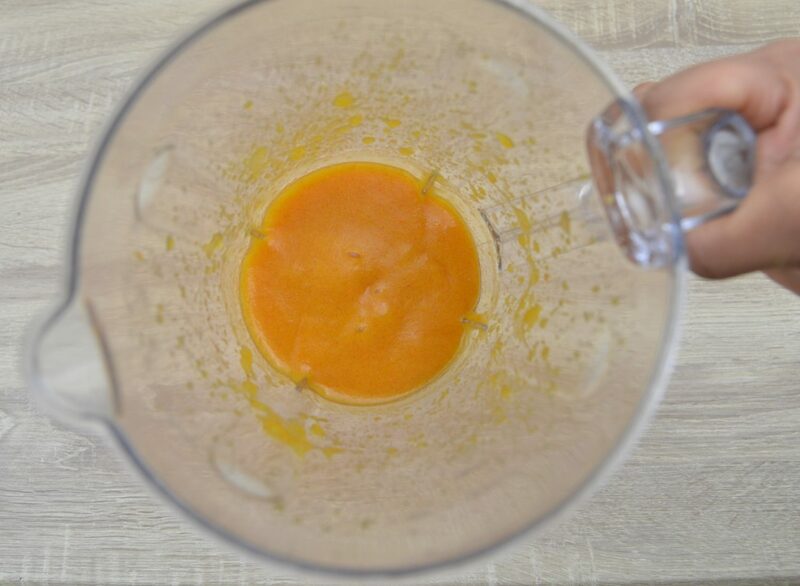 In case persimmons are not fully ripe and if you feel it is difficult to blend then add little milk as and when it is required while blending. Cooking time may vary depending on type of stove top you use. 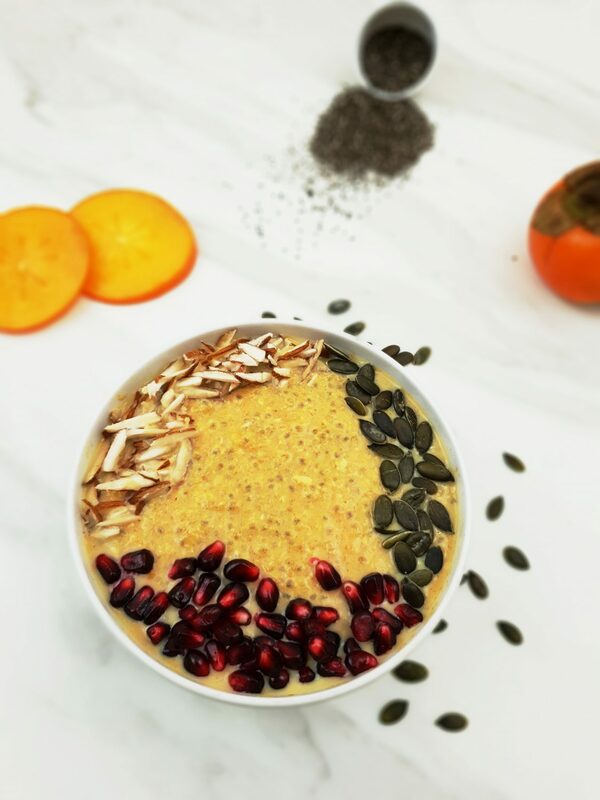 Warm chia persimmon porridge is rich, thick and healthy porridge ready to eat right away. This quick and instant breakfast will be ready in minutes and doesn't require overnight soaking. This is absolutely delicious and just perfect to start your day. If you like this recipe, please leave me a comment, rate it, pin it for later or share it. It means a lot to me. Thanks!! Follow me on Facebook, Pinterest, Instagram or subscribe to my Youtube channel. This looks so delicious! I’ve never thought of making warm chia porridge before, but now I have to try it. I also don’t want cold breakfasts at this time of year! Isn’t this a perfect breakfast for this cold weather. I would love to know how you enjoyed it. This looks so tasty, I’ll definitely be making a vegan version for myself and my children, who love persimmon. The touch of cardamom sounds amazing, I never would have thought to add it but I can totally see how it would work. How cool is this? 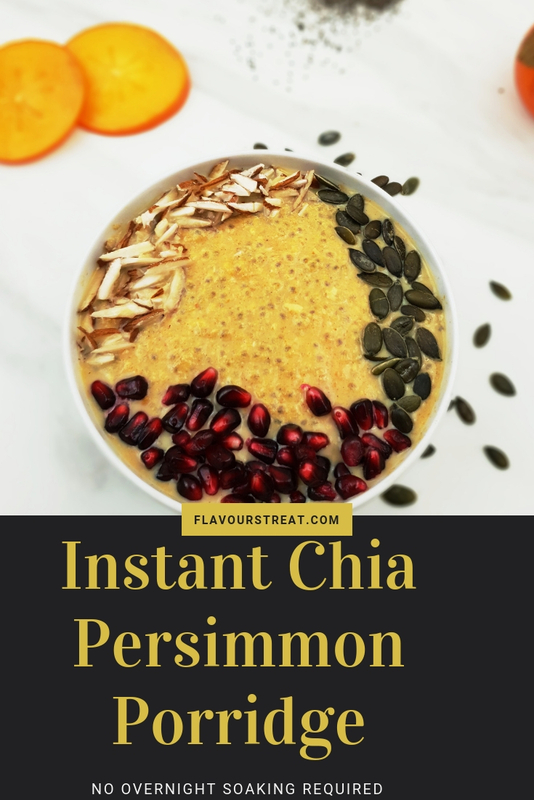 I’ve never cooked with chia (other than baking) and I didn’t even know persimmon puree existed! Must try this out–it looks delicious and so nourishing. Yes it is perfect and healthy breakfast to kickstart the freezing day. I would love to know how it turned out. This sounds so interesting so I’m looking forward to trying this porridge recipe! Those flavors, wow! Glad you like this recipe. I hope you do try and let me know how you enjoyed it. That looks and sounds so delicious! I can’t wait to try it! Perfect for this time of year! It is absolutely a delicious and healthy breakfast to enjoy in this time of year. Do try and let me know how you enjoyed it. A warm chis porridge is so comforting during the cold season. Love the use of persimmon. I am glad you like this recipe. I hope you do try and let me know how it turned out…. Usually, chia seeds porridge consumed during summer times, a nice recipe for winter too! Love both ingredients so this is right up to my street! I’ve never had warm chia seeds but this sounds a lovely idea and so healthy too! It is indeed a healthy and perfect breakfast in this cold weather.